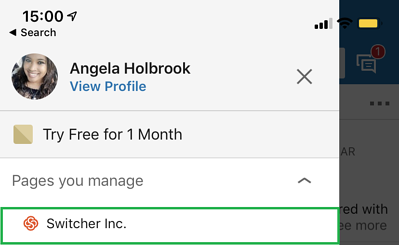 Including video content on your personal profile enhances your LinkedIn account and gives an added glimpse into who you are as a person. 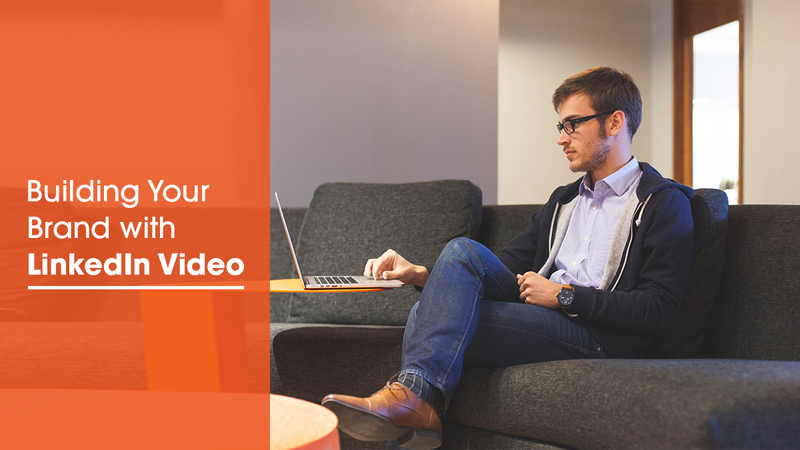 It's easy to get started and add videos to your LinkedIn profile. Just ensure that your mobile device's operating system is up to date, along with your LinkedIn app. 1. At the top of your Home feed is a field to "Write a post." Two icons sit beside it: a video icon and a camera icon. Tap on the video icon. 2. 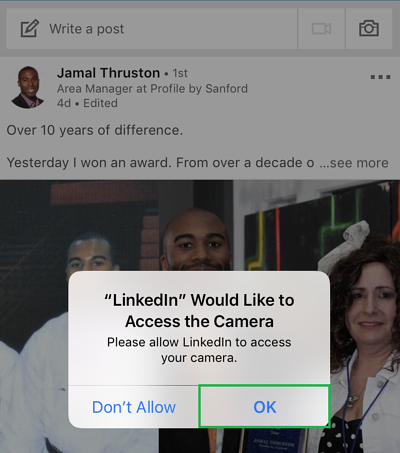 If this is your first time adding videos or photos to LinkedIn with this device, the LinkedIn app will ask for permission to access your camera, photo library, and microphone. Allow access to all three. 3. A live feed now appears on your screen. Tap on the large red button at the bottom of the screen to begin a new recording. 4. 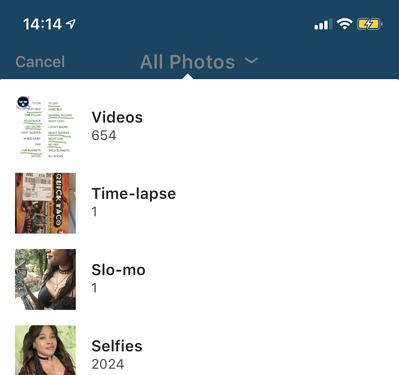 If you'd prefer to upload a prerecorded video, tap on the photo library icon on the bottom left of the screen. Your assets appear in chronological order from newest to oldest, so scroll down until you find the one you need. 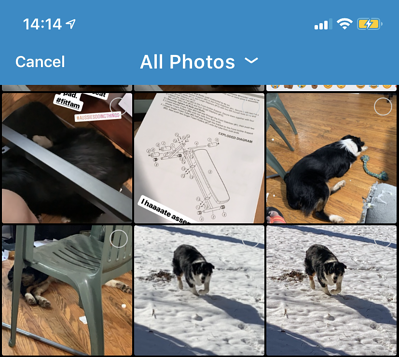 If want to see only the videos in your photo library, tap on All Photos at the top of the screen. When a dropdown menu appears, tap on Videos. 5. You now see all of the videos on this device. Tap on the video that you wish to import. 6. 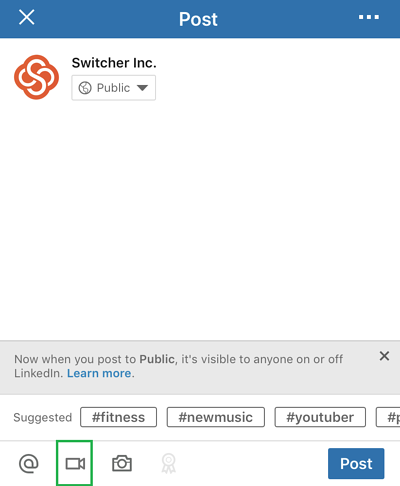 Like other social media networks, LinkedIn lets you add stickers to customize your videos and make them fun. 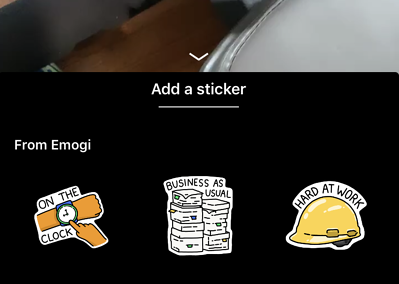 An option to add stickers automatically appears. Add stickers if you wish. 7. When the customization is done (if desired), your video will be uploaded to your LinkedIn profile. Make sure to add a snazzy caption to explain the purpose of the video and to draw in viewers. Uploading video to your LinkedIn page is similar and just as quick and easy. 1. From the Home feed in the mobile app, tap on your profile picture in the top left corner. This opens a menu. 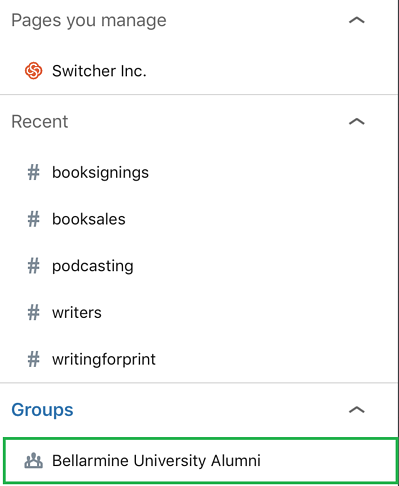 All pages that you manage are shown here. 2. Select the page to which you'd like to add video by tapping on its name. 3. In the field prompting you to "Write a post," you'll see a video icon — tap it. This takes you to the page post screen. 4. Tap on the video icon at the bottom of the post creation screen to add a video from your device's photo library. 5. Refer to steps 4 and 5 under "How to upload video to your LinkedIn profile" above to see how to choose a prerecorded video. Add an appropriate caption for the video in the text box above. And don't forget to add an appropriate hashtag to increase your video's findability. 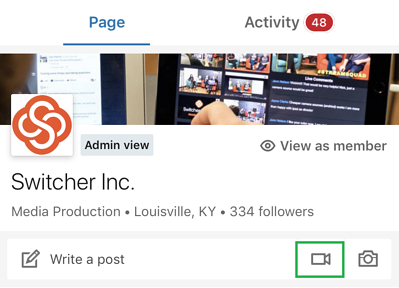 Adding video to your LinkedIn group is just as simple as adding it to your profile or page. 1.  From the Home feed, tap on your profile picture in the top left corner to open the menu option. Look further down in the menu, and you will see the groups you've joined. 2. Tap on a group's name, and you will be taken to that group's page. 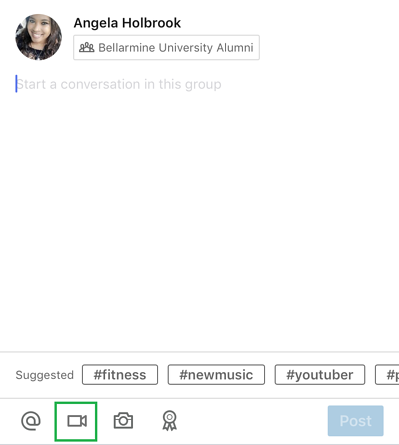 You can now upload a video into the group. 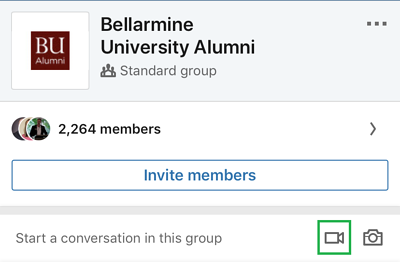 To get started, tap on the video icon to the right of the "Start a conversation" field. 3. You can now make a post. Tap the video icon again to upload your video. 4. Refer to steps 4 and 5 under "How to upload video to your LinkedIn profile" above to see how to choose a video. When you are done, add an appropriate caption and some hashtags. Everyone in the group can now enjoy your video! The ability to record and post LinkedIn videos directly within the app allows for spontaneous video. These videos can document your current conference, event, and more. However, high-quality videos look and feel more professional, and they get many more views as such. Many mobile apps like iMovie and KineMaster are great for editing video right on your phone. 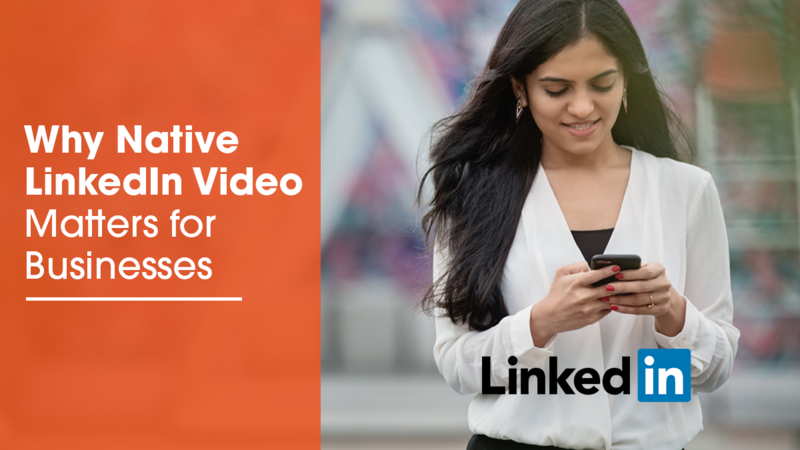 Shoot your video with your phone's native camera app, edit it with a mobile video app, and upload it to LinkedIn. 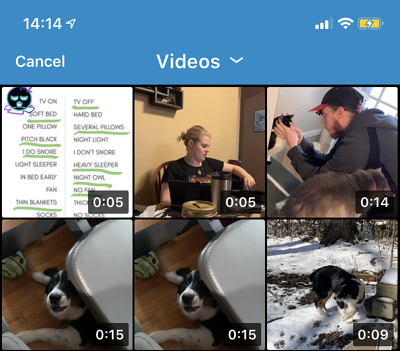 You can also produce videos on your desktop with programs like Final Cut Pro and Adobe Premiere Pro, send them to your phone with Dropbox or Google Drive, and upload them to LinkedIn from there. Remember that LinkedIn is a business-focused platform. Your LinkedIn videos should represent your brand and remain professional, compared to the more casual videos found on your Facebook, Instagram, and SnapChat feeds. To learn more about video how-tos and strategy, subscribe to the Switcher Studio blog, and follow us on Facebook to see our own weekly live show, #StreamSquad.